Nelson Rolihlahla Mandela died on 5th of Dec 2013 …. ..for most of the world, Mandela is a hero of the struggle against apartheid and for nonracial democracy. The election of Mandela, the father of democratic South Africa, as president in 1994 marked both the end of a racist regime and the country's embrace of racial reconciliation. The ANC represented the main opposition to the government during apartheid and therefore they played a major role in resolving the conflict through participating in the peacemaking and peace-building processes. To outside World Mandela is synonymous with ANC ~ though it existed far too early to his rising. The African National Congress (ANC) is the Republic of South Africa's governing political party, supported by its Tripartite Alliance with the Congress of South African Trade Unions (COSATU) and the South African Communist Party (SACP), since the establishment of non-racial democracy in April 1994. Members founded the organisation as theSouth African Native National Congress (SANNC) on 8 January 1912 at the Waaihoek Wesleyan Church in Bloemfontein to increase the rights of the black South African population. John Dube, its first president, and poet and author Sol Plaatje were among its founding members. The organisation became the ANC in 1923 and formed a military wing, the Umkhonto we Sizwe (Spear of the Nation) in 1961. Burying the past, ANC is the ruling party of post-apartheid South Africa on the national level since 1994. It increased its majority in the 1999 elections, and further increased it in 2004, with 69.7% of the votes. In 2009 its share of the vote reduced slightly, but it remained the dominant party with 65.9% of the votes. Mandela's governance was characterized by racial reconciliation, especially with white Afrikaners, which he shrewdly promoted through the use of symbols. He publicly supported the predominately white national rugby team. He took tea with Betsie Verwoerd, the widow of Hendrick Verwoerd, the chief architect of apartheid. He avoided African National Congress (ANC) and black African triumphalism; there was no wholesale change in Afrikaner place names during his presidency. He insisted on the rule of law. Apartheid may have been a crime against humanity, but there was no extra-legal "revolutionary justice." Despite all this, race continues to be the overwhelming predictor of voting behavior. Despite the all-race character of the governing ANC, most of its electoral support comes from blacks. Racism continues to be a reality. Among whites it continues, especially in rural areas. The comparisons look too obvious ….. Mandela may not favourably compare with Mohandass Karamchand Gandhi ~ ANC may not sound similar to Indian National Congress but there are similarities …….. The African Nation is still mourning the death of Mandela – they braved driving rain for hours to praise Nelson Mandela but the crowds at his memorial service were unable to hide their wish to bury his successor. Tens of thousands of people, who spent most of the day singing, swaying and dancing, booed every time that President Zuma appeared on the screens inside the FNB stadium. Mr Zuma is head of the African National Congress (ANC) - the party that led South Africa out of apartheid, and Mandela championed until the end. Zuma was no clan and did not come as a heir-apparent …. ~like Mandela, Mr Zuma was incarcerated at Robben Island as an ANC activist in the 1960s. He spent 10 years behind bars for his political beliefs. Mr Zuma's rise to the head of the ANC was a strategic move to oust Mr Mandela's successor President Thabo Mbeki - who was seen as too intellectual and aloof to connect with the common man. Mr Zuma - a self-taught herd boy - was thought to be more populist, more in tune with the average African man. 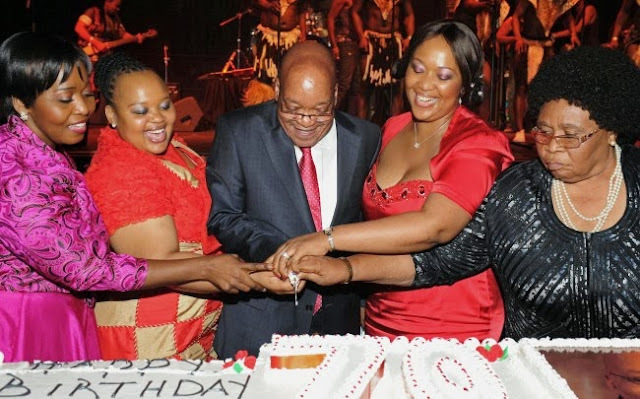 ~~ but what is that you get to read of Zuma ….. it is mostly of his polygamy – that Jacob Zuma has wed six times and has 21 children now – polygamy is legal there. ~ not to end there…. A couple of month backs there were reports that the royal family in Swaziland are growing impatient with President Jacob Zuma for not marrying Princess Sebentile Dlamini. Newspaper reports quoted members of the Swazi Royal House as stating that King Mswati III upped the pressure on Zuma to complete the process of marrying his half-sister who was paid lobola in 2002, but later made no efforts to consummate the marriage. Reading of his political career will reveal that Zuma did not get the mantle on a platter, he joined politics at an early age, joined the African National Congress in 1959. He became an active member of Umkhonto we Sizwe in 1962, following the South African government's banning of the ANC in 1961. Zuma joined the South African Communist Party (SACP) in 1963. That year, he was arrested with a group of 45 recruits near Zeerust in the western Transvaal. Convicted of conspiring to overthrow the Apartheid government, a government led by white minorities, Zuma was sentenced to 10 years' imprisonment, which he served on Robben Island with Nelson Mandela and other notable ANC leaders. Zuma first left South Africa in 1975 and met Thabo Mbeki in Swaziland, and proceeded to Mozambique, where he dealt with the arrival of thousands of exiles in the wake of the Soweto uprising. He steadily rose to power in ANC working closely in its various wings and in 1987 had to leave Mozambique too. Following the end of the ban on the ANC in February 1990, Zuma was one of the first ANC leaders to return to South Africa to begin the process of negotiations. Zuma’s Zulu heritage also contributed to his rise in power struggle. All that is part of history now….. recent reports emphasise that in front of 90 world leaders - including Barack Obama and David Cameron - the crowds booed Mr Zuma persistently. They stuck their thumbs down and even used rotating hand movements - normally used to call for substitutes at football matches. Archbishop Desmond Tutu scolded the crowd. "You must show the world you are disciplined. I want to hear a pin drop," he said. But it was too late. The crowd had already showed the world what they thought. The booing surprised even the South African media. The theory went that Mandela's legacy celebrations should bolster Zuma's image, who flaunted his closeness to Mandela. So, ANC got the coloured the freedom and formed the governance – Mandela rose to the helm …. Zuma was to succeed him later….. the signs at Mandela’s funeral clearly reveal that all is not well with South Africa, at least with its leadership. Leaders need to connect with people …. They have to stay alive to the needs and demands of people …. No legacy inherited can withstand for decades ~ for the mere name of any party may never be good enough unless they have a leader who is capable of understanding the woes of common man, leads by example and ensures that the people are cared for.